Abuja — The August 2018 edition of the monthly financial and operations report of the Nigerian National Petroleum Corporation (NNPC) released Thursday indicated that after about six months of recording back-to-back profit on its operations, the corporation slid back to loss-making with about N3.90 billion incurred as operational deficit for the period. The report also showed that eight subsidiaries of the corporation have persisted in making losses for the state-run oil firm. The eight subsidiaries with their persisted poor operational performances were listed by the corporation in the report. According to the report, the three refineries of the NNPC in Warri; Port Harcourt; and Kaduna, collectively incurred an operational deficit of N10.79 billion, making them the largest loss-making subsidiaries of the corporation. The other loss-making subsidiaries of the corporation according to the report included the Nigerian Pipelines and Storage Company Limited (NPSC) which is charged with the task of building, maintaining and managing pipeline and storage infrastructure of the NNPC across Nigeria. It is also responsible for managing the transmission and storage of petroleum products, the NNPC Shipping; the NNPC Ventures and the corporation's corporate headquarters. Describing the situation, the report stated, "This 37th edition of the report indicated a trading deficit of N3.90 billion which is 179.87 per cent lower than the previous month's surplus of N4.88 billion. "This drop in performance month-on-month is principally attributable to the drop in performance of NPDC owing largely to revenue decrease and higher expenditure level when compared to previous month in July 2018." The report explained that the refineries' production in August amounted to 21.51 million litres of petroleum products as against the 38.64 million litres produced in July 2018. According to it, "The corporation has been adopting a merchant plant refineries business model since January 2017. The model takes cognisance of the products worth and crude costs. The combined value of output by the three refineries (at import parity price) for the month of August 2018 amounted to N8.67 billion while the associated crude plus freight costs and operational expenses were N9.78 billion and N9.68 billion respectively. 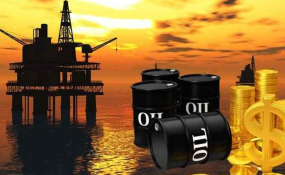 This resulted to an operating deficit of N10.79 billion by the refineries." It added that for the month of August 2018, only the Warri and Port Harcourt refineries produced 53,881 metric tonnes (MT) of finished petroleum products and 8,017MT of intermediate products out of the 56,804MT of crude processed at a combined capacity utilisation of 3.02 per cent compared to 4.83 per cent combined capacity utilisation achieved in the month of July 2018. It further explained the lower operational performance recorded was as a result of the ongoing revamping of the refineries which it noted is expected to further enhance capacity utilisation once completed. On oil production, the report stated that a total of 57.45 million barrels (mb) of crude oil and condensate were produced within the period, thus representing an average daily production of 1.85 million barrels (mbd). "This represents an increase of 3.95 per cent in the average daily production compared to June 2018 average daily performance. Out of the July 2018 production, Joint Ventures (JVs) and Production Sharing Contracts (PSC) contributed about 33.65 per cent and 40.50 per cent respectively. While AF, NPDC and Independents accounted for 14.24 per cent, 6.15 per cent and 5.46 per cent respectively. "In July 2018, crude oil production in Nigeria increased by 70.35tb/d or 3.95 per cent to average 1.85mbd compared to the month. Production during the month was affected by shut-down of Nembe Creek Trunk Line (NCTL) and Trans Forcados Pipeline due to leakages while ERHA and USAN terminals were shut for maintenance and tank top management. "Production was also cut back at Bonga, Agbami, Yoho, and Odudu terminals for issues around Christmas-tree change out, rig movement and the like," the report stated. It further said that in August, a total of 86 pipeline points were vandalised of which only two pipeline points failed to be welded, adding that it was an improvement over the 204 vandalised points recorded in the previous month. The NNPC report stated that as part of the corporation's refinery collocation initiative designed to boost local refining capacity and end the era of petroleum products importation, it has plans to establish a 100,000 barrels per day (bpd) brownfield refinery in both Port Harcourt and Warri.